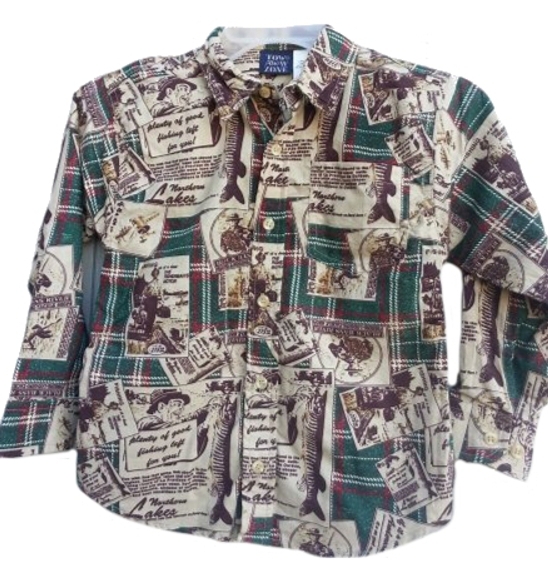 This boys 100% cotton shirt has a Retro 70's lake and river fishing pattern. The colors are hunter green, burgundy and khaki. A fun themed shirt with slogans like Plenty of Good Fishing Left For You and Northern Lakes, Fishing At Its Best. From Tow Away Zone. A nice quality shirt and a nice value. Machine wash. Runs true to size.